With scConverter you can add annotations like stamps, text, barcodes, images and much more to the converted output files. In this tutorial we will look at a few samples on how you can add such annotations, also called markup, to your files. Each of these functions accepts a string parameter for markup input. This string may either be a fully qualified file name, or it may contain markup XML data. The file may contain binary markup data, which can be created by ViewCompanion and scViewerX, or markup XML data. 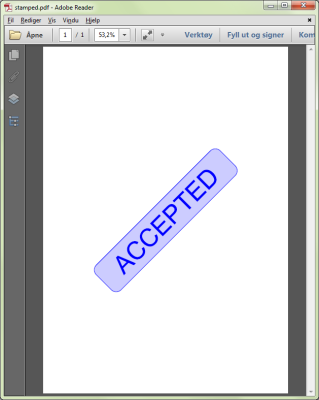 This XML code will add a stamp at center of page (center position set to 50% in both width and height) with a rotation of 45 degrees with the text "APPROVED". 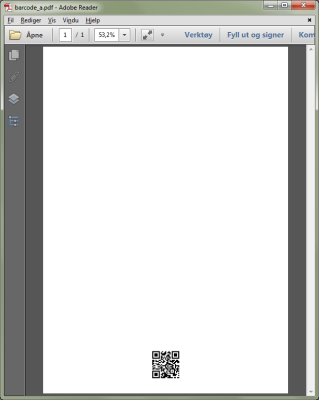 This XML code will add a barcode at center of page width and 25 mm above bottom. The width and height of the QR image is set to 25mm. The Page is set to -1, and this will force the annotation element to be added to all pages in a file.